Little T is about to turn 7 and he wants a Meep and a Nintendo DSi for his birthday. Oh, and a pocket watch – all things he didn’t get for Christmas. He drew a series of them in church one day utilizing every page of the bulletin. And then confided he’s always wanted one. Who knew? Now, what kind of kid wants a pocket watch? This is the same child who recently made a remote control that can destroy the world out of a Trident gum box, two metallic gum wrappers and half a roll of scotch tape. For three days, he pretended he was Toby the dog. Until his dad told him he couldn't be Toby anymore. On any given day, you might see him running around the yard with a cape, rain boots, a snorkel mask and a cowboy hat. Shirtless. He’s the child who didn't like the way his shoes fit so he fixed them with tape. He chose to communicate entirely in gibberish one night at dinner; and closes his blessing with a “peace out” to God. He can quote any show, any movie, any time. When I told him something recently that he didn’t think was cool, he said “that’s so not ditch the wives.” I don’t know what that means. He’s the child who is actually frustrated because he doesn’t have more time at school to turn in his best work, instead of “medium” work (his words). Keep in mind he always gets glowing comments from his teacher. He got an eye patch for Christmas. And a camera on which he recorded an “extreme rocket launching video” to put on YouTube. Or to send to The Discovery Channel. His newly found favorite show is Swamp People. 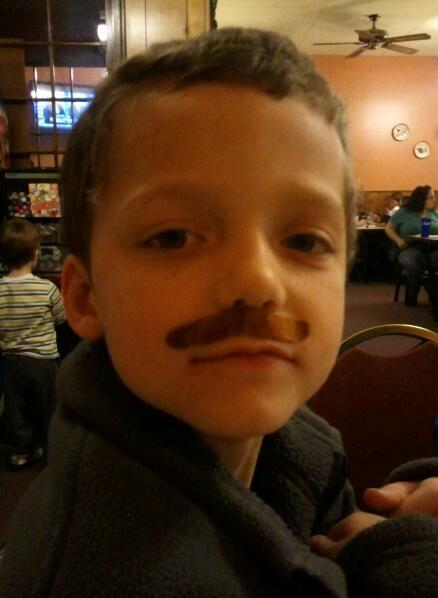 He loves mustaches. And Afros. He's always been his own person, completely unafraid to let his freak flag fly. I love that about him. A pocket watch? Not really so surprising. LOVE this post and your son! What a creative, brilliant mind! Pocket watch, it is!